TRAVEL BAG INCLUDED (51 ï¿½ï¿½ x 12" x 4"). Graphics turnaround 3-5 business days after proofs are approved. Please call for production schedule if you need it sooner. Turn around times based on orders with up to 10 banners. For more quantities please call us to get estimated turnaround time. 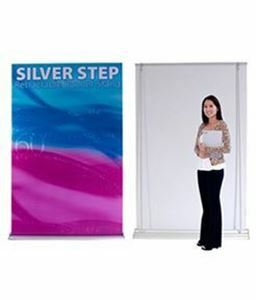 Download PDF Template Silver Step Retractable Banner Stand 60"
Copyright © 2019 Dynamic Signs & Graphics. All rights reserved.